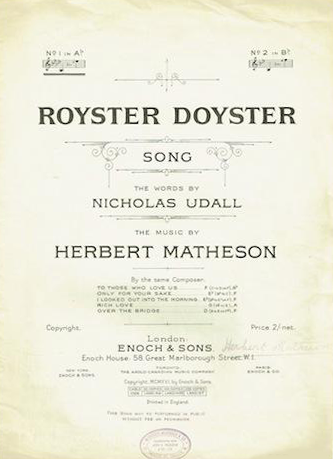 Herbert Matheson (born Herbert Matheson Goldstein) was an organist and composer of popular songs. He was born in 1883 in Upper Clapham, London and attended Merchant Taylors’ School from 1897 to 1900 where his father was a Master. Herbert attended the Guildhall School of Music and gained an ARCO (Associateship Diploma) of the Royal College of Organists. He became organist of the church of St Swithin London Stone in 1906. St Swithin London Stone was a Wren church near Cannon Street in the City of London which contained within its wall the somewhat mysterious London Stone. Alongside his duties as an organist, Herbert had a sideline composing parlour songs. During the late Victorian and Edwardian periods before gramophones and radios replaced the piano as the primary source of musical entertainment in houses, songs for voice and piano were published in great quantities. These were not art songs in the lieder tradition, but were romantic ballads, comic songs, patriotic marches or religious songs. Many were derived from popular plays, concert parties and music hall, and are in many ways the bridge between operetta and today's musicals. Herbert began publishing songs in 1907, mostly love songs such as "Do you think you could love me?" and novelties such as “Maxi, take me in a taxi”. One of them is published in a collection called The Mortimer concert party album, suggesting Herbert may have had some involvement with these entertainments. Concert parties were popular touring variety shows, sometimes known as Pierrot troupes, and continued in popularity throughout the War as a morale booster both at home and for troops serving abroad. Herbert married Ethel Robson on 3rd April 1913 at the Roman Catholic church of Our Lady of Good Counsel, Stoke Newington at which time he was living in Upper Clapton in Hackney. A daughter, Barbara Dawn Goldstein, was born on 13th May 1915 at which time they were living at 33a Powis Square in Notting Hill. The outbreak of World War 1 did not call a halt to Herbert's song publishing. A song cycle The Garden of England was released in 1914, featuring patriotic evocations of England, one of hundreds of such songs published in this period. However, the anti-German sentiment of the time did lead to Herbert changing his surname by deed poll from Herbert Matheson Goldstein to Herbert Matheson. This was a common move for families with German-sounding names, for example the composer Gustav Theodoric von Holst, the family of the poet John Betjemann and the British Royal House of Saxe-Coburg and Gotha. Some of his songs were published under the pseudonym "Herbert Mackenzie", possibly to separate the comic and sentimental-sounding songs from his more serious role as an organist (although the majority of these were published during with this name after the outbreak of war, so it may have been for the aforementioned reason of sounding less German. His most regular collaborator was the American lyricist Edward Teschemacher (1876-1940), who also published at this time under the pseudonym Edward Lockton. He was killed in action on the Western Front on 24th March 1918 during the German Spring Offensive. His grandson Paul Thompson informs me that Herbert's wife Ethel died in April 1968, surviving him by fifty years. The church of St Swithin London Stone was destroyed during WWII and demolished in 1962, but he is commemorated as H.M. Goldstein on the Merchant Taylors School war memorial. I regret that I have been unable to source a photograph of Herbert Matheson for this article. Herbert's 1918 song "Way back home (Someone back home is thinking of you)" is available to download at the Library of Congress World War I sheet music collection. List of catalogued works - derived from the entries in the British Library and Copac. Across the sands of time. Song, words by Edward Lockton. (London : West & Co 1917). Down the Starlight road. Song, words by Edward Lockton (London: West & Co. 1918). In the misty land of someday. Song, words by Edward Lockton. (London: West & Co 1917).